Sharjah: the Gate to Trucial States is part of the Tentative list of UAE in order to qualify for inclusion in the World Heritage List. Sharjah: the Gate to Trucial States probably will be the next nomination from the United Arab Emirates (UAE). A visit to Sharjah and the selected locations provides a great excuse to dive deeper into the history of the UAE. Between 1820 and 1971 they were known as the ‘Trucial States’ because of their treaties with Britain, which effectively made them a British protectorate. ‘United’ is an important word here: the main thoroughfare of the Dubai metro is called ‘Union’, and you may recognize ‘Etihad’ (Arabic for Union or United) from the Abu Dhabi airline. Sharjah is the third ranked Emirate within the UAE, after Abu Dhabi and Dubai. Politically, it has much less influence than the other two which emirs always act as the union’s president and prime minister respectively. I went there by public bus E307A from Dubai’s Abu Hail metro station, an easy 25 minute ride. The cities of Dubai and Sharjah have actually grown together, many people live in the cheaper Sharjah and work in Dubai. The TWHS consists of numerous (too many?) locations, most of them in the capital Sharjah City but some lie much deeper inland until as far as the Oman Gulf coast (such as the Khorfakkan Fort, 140km away). From the Sharjah bus station, I walked on the Corniche along the Sharjah creek to the historic center. This 'Heart of Sharjah’ is largely a reconstruction, and it is still being developed. It is intended to become a traditional style neighbourhood with museums, shops, hotels, cafes and restaurants. This must be finished in 2025. Now only one little street is open for business. Around the corner lies the impressive Fort of Sharjah. In 1970 only one tower of it was left, but the authorities decided to save it and restore the whole fort (which was completed in 1997). It has a lot in common with the forts I saw in Oman: there is always a prison and a date storage room for example. Fortunately the rooms are all decorated here, and there is plenty of explanation in English and Arabic. My next destination was the Mahatta aviation museum. Sharjah holds a special place in the history of intercontinental aviation. Before airplanes could cover long distances, such as the popular colonial route between England and India, they needed intermediate stations. In 1932 the British hired a piece of land in Sharjah on which they could build such a station. The stations were not only used for refuelling, but the passengers also stayed there because the planes did not fly at night. In the museum an interesting old British film is shown with a day out of the existence of this air station (‘Air Outpost’, 1937). 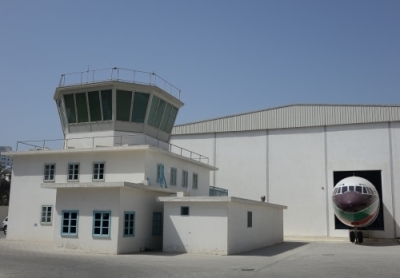 The hangar, traffic tower and the accommodation and office spaces are still completely intact. They lie within the limits of a modern fort. Only the runway was converted into a road. In the hangar a number of old aircraft are shown that have a relationship with flying to Sharjah. In the other rooms the history of this airport, which was functional until 1977, is told. It is a very nice and special museum, and to me worth the inscription on its own. All together I found Sharjah a pleasant and interesting place to visit. Besides the TWHS locations named above, I also went to the Museum of Islamic Civilization and did a Hop on Hop off-bustour through the more modern parts of the city. In 1970 this was still a modest fishing village. The oil money since has been invested mainly in gaudy buildings in a global type of Islamic style. All ministries, museums, the new souk - they look as if they were copied from Istanbul or Delhi.